Many debtors will offer less than the full debt to settle an account. As a Creditor, you have a decision to make. Without knowing what to expect from litigation, it is virtually impossible to make that decision on anything other than emotion. Your decision may feel good, but will it make your more money? Let’s take a look at both litigation and settlements and compare them. That way, you can review the offer strictly in terms of producing money. Litigation feels righteous, but, in fact, there are a lot of hidden problems. 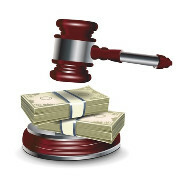 First, you have to pay court fees even if the attorney is working on a contingent basis. These fees vary widely from state to state and according to the amount of your suit. Generally range between $200 and $500 before your claim is completely through the court system. Next, you have the growing problem of a counter-suit. This is a defense tactic to raise the cost of your suit to put pressure on you to fold. It doesn’t have to be a legitimate problem, but you will need an attorney to defend you and that will definitely not be contingent. These are only one in a hundred, but it does add costs to the average litigation process. If the suit is contested, and that is happening more frequently, you also have to spend your time in a court room waiting for your turn. This usually includes a roll call, a mediation session and, if necessary, a trial. In between there is usually a lot of down time. If you are paying an employ a day’s salary for the court experience, it should come off your suit profits. Finally, a bit less than 25 cents is recovered for every dollar of judgment. If you get judgments on 10 claims totaling twenty thousand dollars, you can expect to wind up with a total collection of about five thousand dollars. Out of this the attorneys will take their share for their contingent work. You also have to subtract the days your employees spent in court, court fees and defense charges from this amount. If it doesn’t look good, you’re learning. We like to alter the odds by checking assets such as property ownership or employment. This substantially raises the profitability of litigation, but it still isn’t close to one hundred percent. Even if you could get paid in full on seventy percent of all suits, which won’t happen, your overall profit will be less than accepting a seventy percent settlement. Unlike suits, the vast majority of settlements are paid. If they are not paid, the settlement is defaulted and you go back to the original full claim which you can, if you choose, still litigate. The next question is how much should you accept as a settlement. The answer does not depend on the accuracy of the bill or the wording of the contract. Assuming both are perfect, you will have a hard time getting paid by a debtor who is unemployed and has no assets. A Judgment in this case is worth almost nothing. You would not likely recoup your expenses if all your suits were against these debtors. If the debtor has nothing you should take whatever you can get. Hoping that credit bureau listings or Judgments would cause problems in the future is worth less than five percent. This means that a twenty percent offer will put four times as much money in your pocket. Even if the debtor has a job and you know you can garnish wages, a settlement can get you more cash. You may find that the debtor left the job to run away from your judgment or makes so little your garnishment will take ten years. Of course, you still would have all the extra costs I noted before. If the debtor does not have assets, any settlement, even a low settlement, will make your more money. Settlements are not often satisfying. They just get you more money.